Advertorial by FreedomPop: the opinions expressed in this story may not reflect the positions of PhoneArena! Bargain hunters, rejoice! California-based FreedomPop (a Sprint MVNO) is up with an enticing, limited time offer - a $29.99 MiFi hotspot that will provide Free 4G data each and every month. The deal includes a one-month free trial of their 2GB 4G/3G data plan. If you're a light data user and don't need as much bandwidth, or just need a data-on-the-go solution, after the first month you'll be eligible for 500MB of free 4G data each and every month without paying a dime. Yeah, you read that right, 500 megs completely free, with the option to add in more if and when needed. FreedomPop also offers to transfer your unused data from the previous month and add it to the current one for just $3.99 a month, so if your usage varies wildly, hoarding your unused data on the cheap is worth considering. The included (credit card-sized) MiFi hotspot can tether data to up to 5 devices, including smartphones, tablets, laptops (or pretty much any Wi-Fi enabled device), and offers battery life of over 6 hours. The Wi-Fi network is completely private, so you don't have to worry about security or outside access. If you think you’ll find yourself in need of internet access when you’re out-and-about, FreedomPop could be an ideal solution for you. The best part? All of this comes commitment-free – no contracts, no cancellation fees, no hogwash. Just the way it should be. 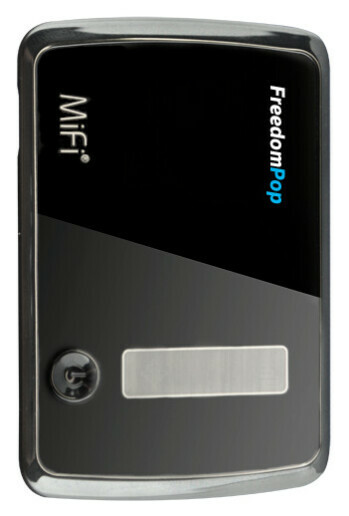 Get 100% Free Internet with the FreedomPop MiFi! You'll be doing a lot of waiting than actually using the Internet with Sprint's slow speeds. Can't complain about 500MB of free data though. This is actually a good thing for a small data amount, if it was a faster carrier that 500MB could be gone before you know it. If this supports Sprint Spark LTE the speeds won't be slow. Just got a Sprint iPhone 6 from work in a Spark market and speeds have been consistently 20-50 Mbps with peaks north of 70mbps, depending on which LTE band you are connected to. I travel at least 2 weeks per month throughout the country for work and the new Sprint network is performing very well. How good is the actual coverage? Verizon is strong all over that area unless you go up to Sequoia through Three Rivers and areas like that. I highly recommend it. I can't trust Sprint, people at my work have no signal and that's unacceptable. Sprints network is atrocious. Keep your money people. I can finally watch Avril Lavigne's music videos for free when I'm out with my friends. Yay. Won't work outside of U.S.
500MB is a great deal but It wouldn't last a day for me!